If we were to believe Instagram, Coachella is all about posing at the iconic ferris wheel (yes, I’m guilty! ), glam pool parties, pretty palm trees, colourful sunsets, celeb spotting…oh and the music, of course! But what it really like to experience three days in the desert? 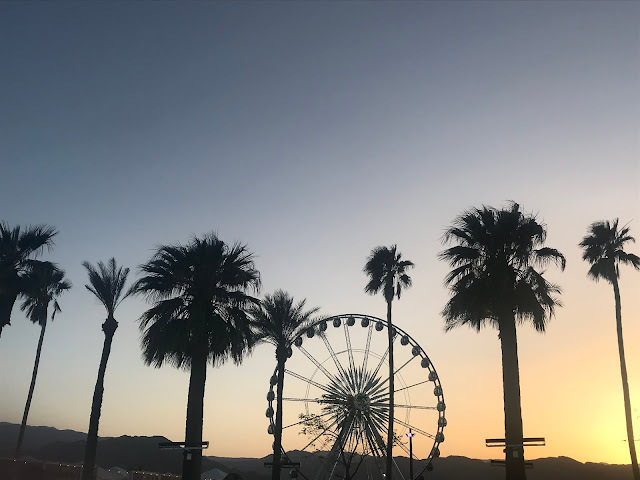 Well grab a cuppa guys and gals and read on for a full round up of this first timer’s experience at Coachella. Advance warning – this is going to be a long one so I’ll split it up into a few sections! Coachella was one of those festivals that I followed online for years but never imagined actually being at myself. I had no idea what to expect, to be completely honest. You read reviews and watch videos but it’s really hard to imagine what a festival in the desert will actually be like! This is coming from someone who isn’t even a festival person…Oxegen scarred me for a life as a teenager I think and the whole outdoors vibe never really appealed again!! Outdoors in California and thirty degree plus heat however, I could get on board with 🙂 We first started talking about this in March 2017, so it felt a bit surreal when we finally took the plunge and purchased the tickets last January. As we took the scenic route with a few stops, the journey took around six and half hours but it was so worth it. I’d definitely recommend it over flying in. We arrived on the Thursday evening and checked in at the Hyatt Hotel in Palm Springs. Two rooms were perfect for our squad of seven and we had plenty of space to get ready each day. The hotel also had a gorgeous pool, which was ideal for relaxing by during the mornings before heading off to Coachella. Palm Springs itself is beautiful – the main strip is lined with quirky bars and restaurants as well as some fab shops. There’s a H&M there, which I was surprised to see. But good to know if you need to pick up any last minute bits! I also fell in love with a store called Francescas, mainly for their jewellery but they had stunning clothes, accessories and gifts too. The outfit planning started the second we secured our tickets and involved a few sleepless nights over the course of the countdown (ok, slight exaggeration…but it was serious business!) I was in my element eyeing up the style and I really enjoyed putting my own looks together too. I tried to go for a different vibe each day and I decided that headpieces would be the common thread across the weekend! As I mentioned in an earlier post, comfort was always going to be key for me and I’m glad I stuck to that! On day one, I went with a sparkly boho look wearing a Nasty Gal glittery playsuit and a Nasty Gal gold headpiece. It gets cold when the sun goes down, so I was glad of my Penneys denim jacket too! Day two was white and western with pops of pink. I absolutely loved my fringe jacket from Boohoo and I’m desperately trying to think of a way to work it back into my wardrobe at home! The top was also Boohoo and the shorts and headband Penneys. My starry sunnies are from Primp & Style. On day three, the planning went out the window. In typical Laura fashion, I woke up and decided I wanted to wear something completely different than I had planned. I had spotted this polka dot two piece in Free People, so I hot footed it back down to the store (a few doors down from our hotel) and that was that! It went perfectly with my round leather bag from Primp & Style. I picked up the headband in Palm Springs to finish it off. Clothes aside, what I really enjoyed about styling up my Coachella looks was the accessories and make-up. It’s fun to play around with your style and push the boundaries a bit. More is more when it comes to accessorising at the festival and I definitely embraced that mantra! I was also delighted to team up with Isadora on make-up for the festival weekend. They kindly sent me a fab kit to experiment with a few weeks before setting off and I discovered some new favourites that I will most definitely be re-purchasing again and again! My top three are the Cover Up Foundation & Concealer, The Contour, Blush & Highlight pallette and the Perfect Eyes Eyeshadow in Golden Glow. If you’ve been following my instagram, you’ll know I’m obsessed with Cover Up. I love it because it’s easy to apply and so long lasting. As it’s a squeezy tube it’s also really easy to transport and throw in your handbag, They now come in travel sizes too which is perfect for holidays! Now, down to the nitty gritty that everyone really wants to know about! A typical day looked like pool (or sleep!) in the mornings, lunch, get ready and head to the festival about 5pm/6pm. You can of course go early (gates opened at 11am) but the main acts we wanted to see were on in the evenings and the night is long, so you’ll need a lot of energy. It was 3/4am when we got back to hotel most evenings! Staying in Palm Springs was lovely but it was about 45 minutes away from Coachella Valley, so we had a daily shuttle bus to and from the festival. These went back and forth all day, so there was always one waiting for us when we were eventually ready to make our way out from Palm Springs. The shuttles were air conditioned and comfortable and perfect for a little disco nap! Arriving at Coachella, you’ll have a good bit of a walk to the main gates and then a couple of security checks. (make sure to allow 30 mins before the time of the first act you want to see). From there, it’s hello ferris wheel and boom..you have arrived! On the topic of walking, there is a lot of that so be very careful with your footwear choices. Don’t break anything in for the first time and stick to flats. Yes, I saw people there in high heels! I went with western style boots and trainers and had no issues. Aching feet is one thing I just cannot cope with any more! I must be getting old!! On the walk in (and out) you’ll also encounter a lot of dust. We had heard this before we went and heeded the advice to all buy bandanas. They ended up being essential! Keep one handy to cover your mouth when necessary. You can even work it into your look as a neck scarf or belt accessory. Just be sure to bring one! Nobody wants the dreaded #CoachellaCough as it’s fondly known! On the first evening, we made the mistake of hitting the first food queue we saw (we were hangry!) but ended out waiting over an hour to be served (we we even hangrier!). Rookie error but we learnt our lesson the next night and explored further afield. As festivals go, the food choices were very impressive. There was plenty on offer and the price points were reasonable too. There were numerous places to grab a drink (the rosè was delicious!) but you can’t bring alcohol into the main stage area. On the second night (for Beyoncè!) we discovered a fab spot to the right of the stage which was within one of the designated bar areas but had an unreal view of the action. It was less crowded too and we had plenty of space to sing and dance our hearts out! Onto the music itself! Beyonce was without a doubt my highlight. I mean, they don’t call her the Queen for nothing. The whole performance was flawless and I was mesmerised! As for the moment when Destiny’s Child appeared on stage…my heart stll flutters when I think about it. I’ll never forget the screams and sheer glee amongst our group, jumping up and down with excitement! Other performances I loved were Kygo, The Weekn’d, Mo and Haim. 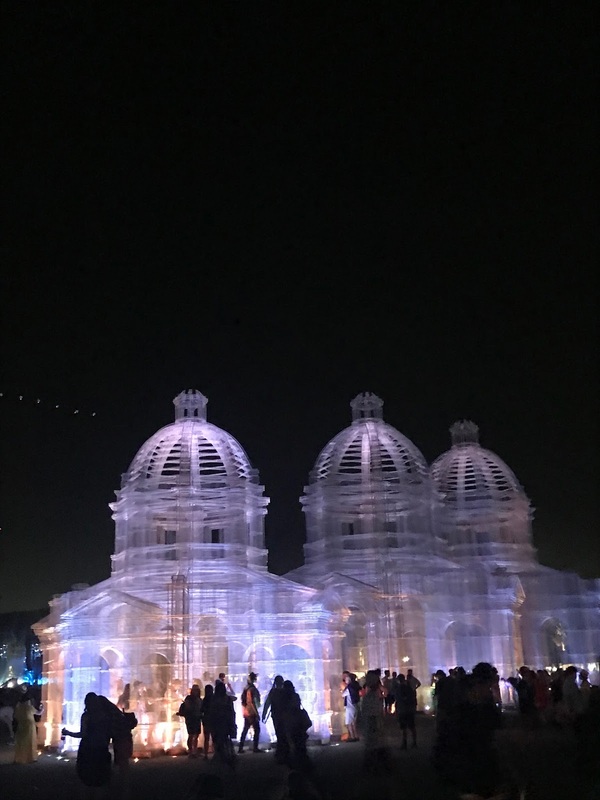 On the Sunday evening, we spent a bit of time exploring the wider site and taking in the amazing art installations and light features dotted around the grounds. 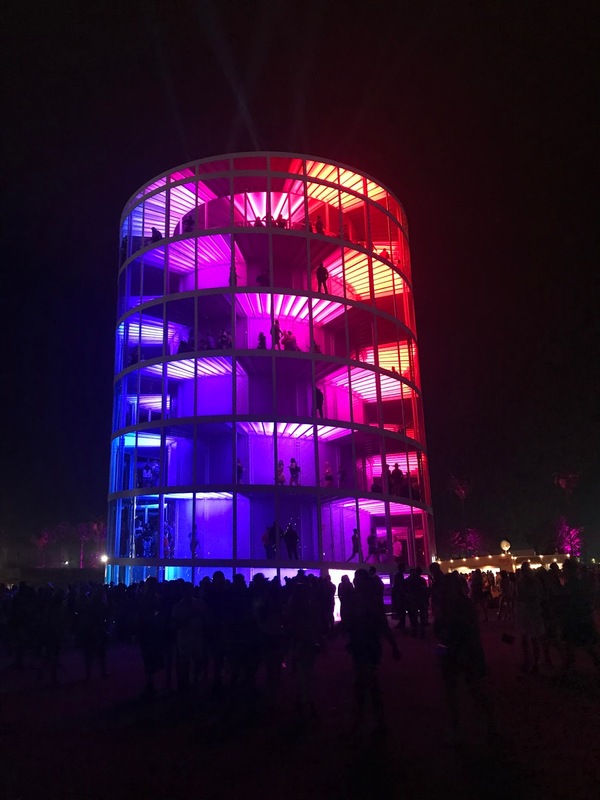 Coachella really comes to life after dark and looks like a magical playground. I adored the giant star and holographic buildings. So for those of you still reading, to sum up, it was a weekend like nothing I’ve experienced before! Was it as everything I thought it would be? Yes! Was I exhausted after it? Yes! Were there moments I hated it and wanted to cry? Yes! Did I make the most amazing memories with my friends? Yes! Coachella was a rollercoaster of emotions, as you can probably tell. The days are long, it’s really hot, you stand in a lot of queues and you do get tired and cranky, it’s human nature! But any negative experience that comes with Coachella comes with the unique environment that is a music festival. No matter how glamorous it’s made out to be, ultimately you’re in the middle of the desert with 79,999 other people! Negative moments are inevitable but they are more than balanced out with the positives.